A new lift has been installed at Warwick Castle improving access for those who are in wheelchairs and mobility vehicles. It was officially unveiled last Friday (September 28) by the Marquess of Hertford and the Mayor of Warwick Richard Eddy, as part of Warwick Castle’s Fun Festival Day. The new lift provides wheelchair users with access to the whole of the ground floor of the castle, including attractions such as the Victorian Royal Weekend Party, the State Rooms and the armour collection displayed in the Great Hall. 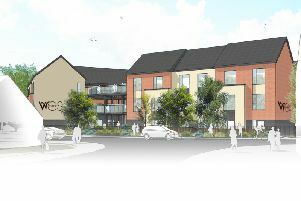 The project required detailed consultation with Historic England and Warwick District Council, with planning and design taking over a year, with a total project cost of £100,000. Nick Blofeld, divisional director at Warwick Castle, said: “We’re delighted to provide enhanced access to even more areas of the castle to all our visitors. “Making amendments to a historic building is never easy, but we were determined to have the lift installed, and appreciate the support and advice from Historic England and the Warwick District Council throughout the project. On the same day that the lift was unveiled, the castle also hosted a fundraising event during the evening. The event, which was a gala, featured performances by the Warwickshire Youth Jazz Orchestra and the County Guitar Ensemble and was raising money for Warwick Castle’s own charity Merlin’s Magic Wand. The charity supports children facing challenges of serious illness, disability or adversity around the world and donations from the evening raised £424.